Yarn: My own handspun merino – don’t know about the yardage, but I’d say about 600 yards of heavy worsted. Love, love, LOVE it! It’s really quite big (about 74″ across the top and 30″ deep) and super cozy. Three of the colourways I dyed; the yellow/green one I bought. Beautiful shawl! Love the colours and I can see you will get lots of wear and compliments from this knitting! What dyes do you use? 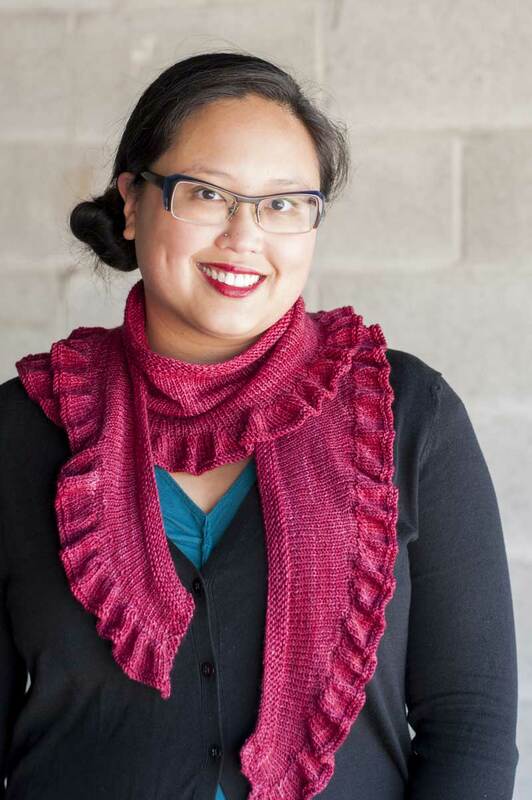 Completely spectacular and totally unlike any other shawl I’ve seen – kudos! OMG, you have daylight?!? That’s as extinct here in Boston as dinosaurs, I tell ya! Seriously, the shawl is awesome, and so perfect for the winter :). oooooh, that is really really gorgeous. wow, the colors look lovely together. must feel extra nice knowing that you dyed, spun AND knit it all yourself. Your shawl is so cool! The colours look beautiful together. Congratulations. Great job! It is so beautiful! Wow, lovely shawl. Those colours really look warm, especially on a cold day like today! They really emphasize the patterning too. It looks like a beautiful sunset! I love the colours – its a very different look to most shawls that I have seen! wow, really nice. i love the long tails in front. great job! and i also love the handspun. you are so productive! Astonishing! Truly beautiful! The fact that you dyed some of the yarn brings it to a whole other level…you must be proud! Ooo, the waviness and the colours… quite lovely. Wow, that is amazing. The colors you used are beautiful together. Its so beautiful. Did you follow the shawl pattern you linked to exactly? Or did you modify (aside from the heavier yarn choice)? I think this is my next project, after I finish the shawl I’m working on, of course! I LOVE the shawl! I plan to start the simple yet effective shawl as soon as I decide what to use for it. I love that particular shape. Your dying is great too. I really like the colors you chose, they are some of my favorites, especially the last bright green. How nice to be able to wear something you’ve knitted and even the yarn is your own product! You’ve finished in a good time to wear this winter.